Treatment and recovery depend on the severity of the injury. Recovery time ranges from 6 weeks to 3 months. 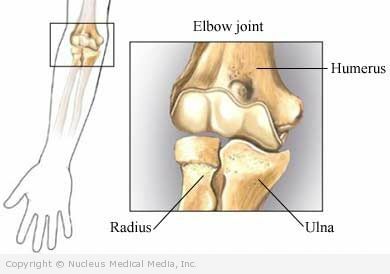 Rest — Do not pitch or do activities that cause elbow pain. Do not play sports until the pain is gone. Cold — Apply ice or a cold pack to the outside of the elbow. Do this for 15-20 minutes, four times a day, for several days. Wrap the ice or cold pack in a towel. Do not apply ice directly to your skin. Medication — Ask your doctor about pain medications because they can mask symptoms. If you or your child has elbow pain, be sure to call the doctor. Physical therapy — After the pain is gone, ask your doctor about strength exercises. Gradual return to pitching — Begin throwing motions. Gradually progress to pitching as recommended by your doctor. Your coach should also know about your treatment. Surgery — This may be needed to reattach the ligament and bony fragment. This is rarely needed. Warm up before pitching with light aerobic exercise (eg, jogging). Stretch your muscles slowly and gently before pitching. Follow the pitching rules of your baseball league. Do not play in two leagues at the same time. Keep track of your child’s pitch count and the number of innings pitched. The American Academy of Pediatrics recommends limiting pitches to 200 per week or 90 per game. Learn and practice good pitching techniques. Do not throw curve balls and sliders until high school. This is when the growth plate in your elbow is fused with the bone.